The following sections show you how to configure publishing of your site. To publish a generated site to GitHub Pages you can use the sbt-ghpages plugin. For sites hosted on S3 one option is to use sbt-s3. We expect other publishing mechanisms to be supported in the future. Set up the plugin by adding the following to project/plugins.sbt (check the sbt-ghpages project for the most recent version). Then configure your sbt build to use a special remote when running on Travis CI and otherwise fall back to the normal Git remote configured via the scmInfo setting. At this point you should be able to run sbt ghpagesPushSite to publish your site. $ git commit -m "Initial import of GitHub Pages"
The following section walks you through the steps to configure Travis CI to publish your site as part of the deployment process. It assumes that you have already configured your sbt project to publish your site using the sbt-ghpages plugin as described in the previous section. The authentication mechanism that enables Travis CI to update the gh-pages branch requires that write access to your GitHub project is granted to an SSH key pair that you control. An encrypted version of the secret key must be added to the Git repository in order for Travis CI to decrypt it and make it available for pushing to your Git repository. This means that anyone with the ability to modify the Travis CI or sbt build configuration will be able to get hold of the secret key and gain write access to your GitHub repository. For this reason it is recommented to disable publishing for pull requests. The instructions are based on this gist and you are encouraged to consult the reasons for choosing this authentication mechanism. 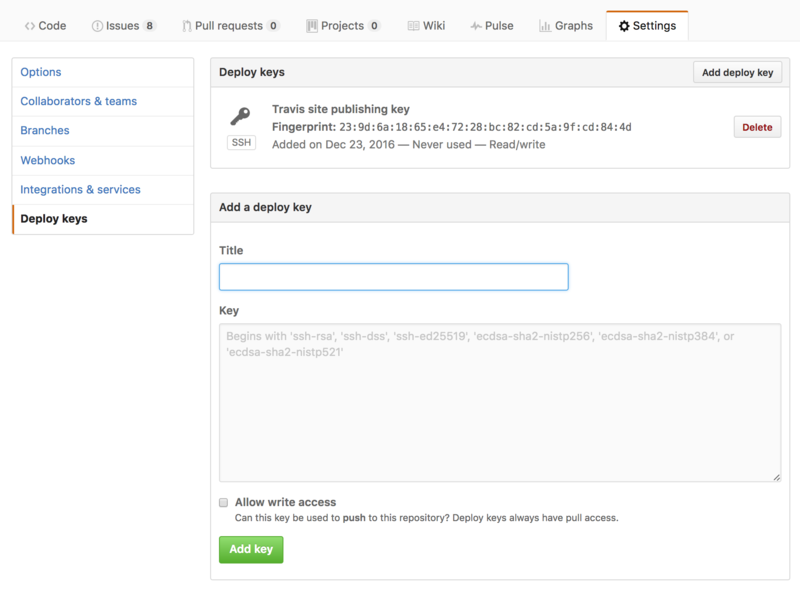 Add the public key found in project/travis-deploy-key.pub as a deploy key in the Deploy Keys section of your GitHub project’s settings page at https://github.com/[org]/[repo]/settings/keys. Make sure you allow write access for the deploy key by clicking the check box. Make sure to add project/travis-deploy-key.enc to the git repository. Make sure not to add project/travis-deploy-key to the git repository. As instructed in the output of the command add the encrypted secret key found in project/travis-deploy-key.enc to the repository and delete or ignore the unencrypted secret key file. Finally, configure a deploy step in .travis.yml using the script provider. For a complete set of options and triggers see the Travis deployment documentation. In this example, we publishing when a tag is created and explicitly disable publishing for pull request. The before_deploy step takes care of setting up the environment so that git push automatically finds the deploy key. - git config --global user.name "$USER"
- git config --global user.email "[email protected]$TRAVIS_COMMIT"
Ensure that you modify the above example to use the instructions on how to decrypt the deploy key provided in the output of the travis encrypt-file command. At this point, it would also be a good idea to run travis lint to check that the resulting .travis.yml is correct.